Chef Philippe Damas is showcasing the season’s best ingredients at this bistro near the Canal Saint-Martin. 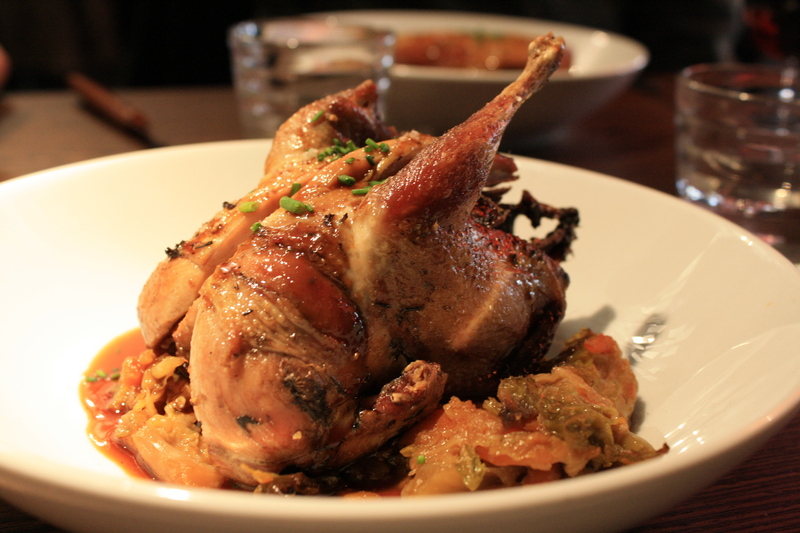 During the season, wild game (grouse, partridge, quail) is suburb here. In warmer months, the sidewalk terrasse is an appealing place to drink from the very affordable wine list. The chalkboard menu changes all the time and dishes are scratched off throughout the evening. 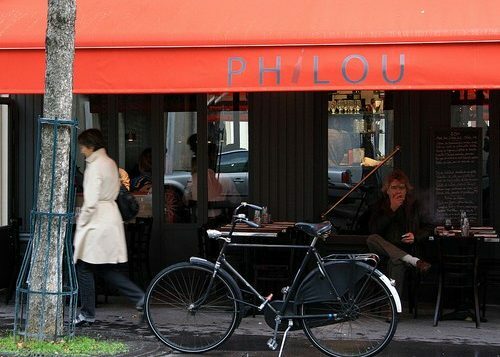 Philou has the feel of an excellent and not overly ambitious neighborhood bistro, and it’s one where I’m happy to return again and again. Hours: Open Tuesday-Saturday for lunch and dinner. Closed Sunday & Monday. 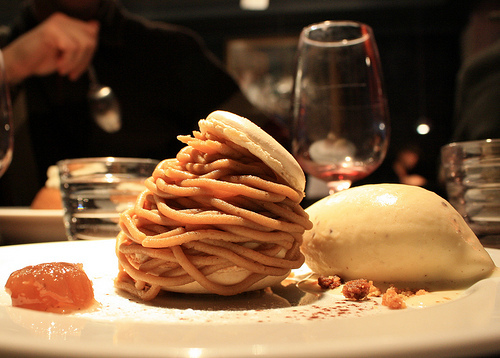 Figaroscope (2011) calls this one of the 15 Best bistros in Paris, praising the pheasant with caramelized endives and the efficient service. 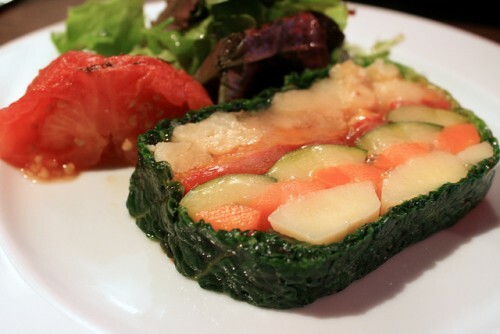 The New York Times (2011) called the food “wonderful, sometimes perfect. Like the marinated sardines with parsley gelée, apples and horseradish. 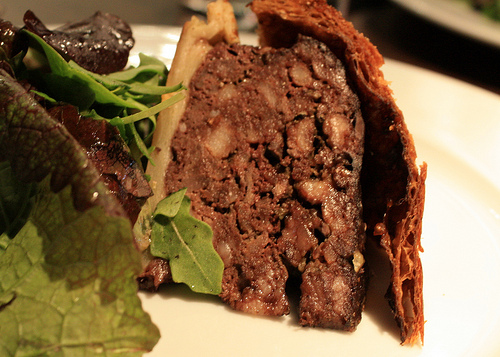 Also wonderful were a dead-on pâté with a jug of cornichons, pork cheeks in a gorgeous dark sauce with celery root cooked in stock.” Bittman also implied the Canal neighborhood was far-flung and dangerous, prompting the Great Eye Roll of 2011. 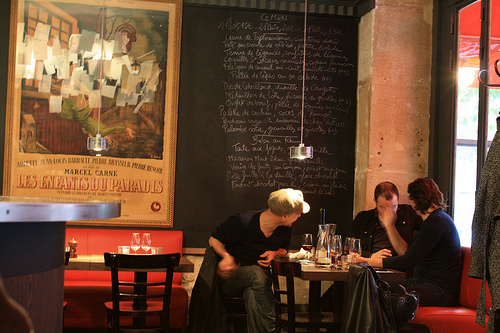 Not Drinking Poison in Paris (2011) calls this “a winningly sharp, modern bistro” with all of the criteria for success in place: well-priced natural wines, a solid market menu and the nearby canal, plus “engaged, reactive service” that was the runaway highlight of his meal. My cousin and I decided to us PBM to find a great lazy minute booking outside because the weather in Paris has been stunning this week. Philou was a slam dunk! We called and they had the best outside table reserved for us for an hour later that night. It has a great neighborhood feel and we were the only American accents in there that night. The wait staff was fun and kind with our weak attempts at French and directed us towards their favorites for the evening…Light flavorful fois gras made in their kitchen with this delightful brioche and miel as a starter. We cleaned the plate. Their ‘steak and potatoes’ Normandy beef with mushrooms and small potatoes was savory and a hearty portion, larger than many I’ve had here. We let them pair our wine carafes with each course and are glad we did. All in all a memorable meal and perfect choice. A great experience in the 10th!!! Sorry, but I can’t understand the hype for Philou at all. Given the fact that for just a little more money you can eat at great places like Abri and Roseval, this shabby looking bistro is hopelessly overhyped. The food is “okay” at best (fatal lack of seasoning; a foul st. jacques in one dish), the wines are rather mediocre (to put it mildly), service is hectical and the room (on the evening of our visit at least) was smelly. Need I say more…? Thanks for this review. We recently went there ourselves and had a great experience. Quality food at reasonable prices, in a nice intimate restaurant.